We have partnered with Creative Computer Consulting to work out a special discount rate for all customers of InspectorSites.com. Creative Computer Consulting SEO packages are $200 off if you have a home inspection website with InspectorSites.com and you purchase the SEO package through our order system. Contact Creative Computer Consulting by emailing jonathan@creativecomputerconsulting.ca or calling 780.471.5485 to start optimizing your website today. The first package that we offer is the Starter Search Engine Optimization Package. We will do On-Page optimization for up to 3 pages. This starter package will give you a sample of what we can do and how much it will increase traffic to your website. Just this starter Search Engine Optimization package alone will improve your rankings at the search engines and increase the traffic to your website a little bit, some of our customers have doubled the traffic to their website in a single month. If you like what you see, we can then apply your payment towards the full On-page optimization package. The starer Search Engine Optimization package is a simple and low risk way to test out our services. On-Page Optimization - The first thing that needs to be done is a full assessment of your website's SEO health using our exclusive Health Check Report. The Health Check Report is included in all of our Optimization Packages and is the first and most important step. The Health Check informs you about where your are right now, if you don’t know where you currently are, how can you get to where you want to you want to go. Your Health Check Report includes: Where is your website ranked right now? When people search on the different search engines, what is your current ranking? How much traffic does your website receive each month, and more importantly, how much of that traffic is from the search engines? We optimize your web content to be helpful for users and search engines. We make sure that our focus on search engine friendly keywords doesn't scare off your visitors. Professional on-page optimization has, in many cases, provided dramatic increases in target traffic for our clients. Each and every page on your website will be carefully scrutinized. We place keywords in optimal places on each page. 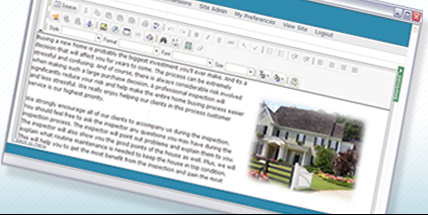 Oftentimes, we recommend adding new pages and content specifically targeted at specific key phrases. This is very effective in improving your rankings, and it can also be beneficial for your visitors, giving them vital information on exactly what they are searching for. This also sets your business up as expert in the industry and visitors love to see you give away free information. The On-Page Optimization (includes Research) price is regularly $1,950, depending on how large your website is. But we are excited to offer all InspectorSites customers a discounted price of only $1,499. We have proven over and over that on-page optimization will dramatically increase your business. Local Optimization and Monitoring Package - Inspector Sites has partnered with Creative Computer Consulting to offer Local Optimization and Monitoring package for all home inspectors. Our clients have found optimizing for local search has a significant impact on increasing website traffic. Google Places is the industry leader in Local Searches, and they are using all of their platforms (Google.com, Google maps, etc) to really push Local Searches. The Local search results at Google come up whenever a city name is added to the search and it is a localized search. But you can see how your business is doing for Local as compared to organic (regular) search results. For example, if you go to Google and search for your city " Home Inspector", you should normally see a map with 3 or 5 local home inspectors listed. These are the local results, and they are above the organic (regular) search results. If you don't see a map (maybe your city isn't determined by google to show the map yet), simply click on the maps tab and wait. You see that a number of your competitors come up. The Local Search results are Google listing all the local businesses and plotting them on a map. There are many factors considered by Google when deciding who appears in the top positions in a Google local search result. Creative Computer Consulting can generate more credibility and relevance for your local business which will result in your business being listed in the Google Local listings, and increased local traffic for your business. Our local SEO consultant is a trained expert with a lot of experience and an excellent track record at producing top results. 2. Make sure you own the listing. So we will claim the listing if it is unclaimed. 3. Standardize all of the listings so that they have all the correct information and details about each of your locations. 4. Enhance the listings with photos and descriptions, making sure that your listings are optimized for your keywords and keyphrases. 5. Provide you with Monthly reports detailing your listings and rankings for each directory, including Keyword tracking. 6. Review monitoring. We will email you a weekly summary of reviews placed on any of the 15 directories. The Local Search Optimization costs $99/month with a one year commitment and will increase your business. The really cool part is that the Local Optimization will also help your website rank better in the regular (Organic) results. You will get dual benefits from the the local optimization and monitoring service. Please don't hesitate to contact me if you have any questions, comments, or concerns. I look forward to continuing to work with you in expanding and growing your business. Off-page optimization - Off-page optimization can mean many things; we focus on quality link building techniques that wont get your website penalized by the search engines. There are many different ways to implement SEO link building to increase popularity, but you need to be very careful, as many methods are ineffective or even potentially dangerous to your websites rankings... we'd be happy to tell you what to watch out for. The Off-Page Optimization (includes Research) price is regularly $1,950, your InspectorSites discounted price is $1,499. Google is recommending and encouraging all websites to have a design that is mobile friendly. This is called responsive design where the website will respond to every screen resolution, making sure that the website looks good on every device from a small iphone or android phone to tablets even up to big screen tvs. Mobile friendly websites are so important to Google that beginning on April 21, they will be using it as strong ranking signal. This means that properly designed websites using responsive design will begin to see an improvement in their ranking. Unfortunately, responsive design is a relatively new technology, only about 6 months old. This means that almost every single website on the internet will need to be updated. When your website was created, there was no responsive design, but now everyone has to convert their website. Google is taking this so seriously that they are making multiple announcements, and warning everyone using Google Webmaster Tools and they have announced the exact date that this will be implemented. We highly recommend that all of our customers get their websites converted to a responsive design. It will cost $299 to convert your current website to a responsive design so that it is fully optimized for all devices. Your website will be personally edited, creating a custom responsive design while not changing the design of your website. Also, your website will be processed through Google Mobile Optimization verification tool that will confirm that every aspect of the website is fully optimized with the new responsive design.